I have been noticing something lately. I have control issues. Okay, this may not be such an awe inspiring revelation. I think most of us have control issues in one way or another. If you're a Mom, you have to be in control of so many decisions. So. Many. And it feels like there are always questions to be answered. It feels like it just won't stop some days. And I realize that the days are sometimes long, but the years are surprisingly short. My youngest had her first sleepover at her grandparents the other night, and I felt like crying. Where did the time go? How did she get to be so big so fast? Had I stopped looking or paying attention somehow? I am with her every single day. I homeschool, so I get to spend more time with my kids than most of the people I know. I was paying attention. I am paying attention. I have to find a way to always answer these questions. Not the easily solved ones, but the parts of my life where I really struggle. But who do I go to for my questions? Well, if I were smart, I would put down my control issues and go to the one who has the answers. All the time. The one who never tires of us asking. He desires a relationship with us, we just have to ask. We have to ask those questions and then we have to do the truly hard part. We have to wait for the answer, trusting that it is all for our good. Ohmygoodness. My heart stops just typing that. 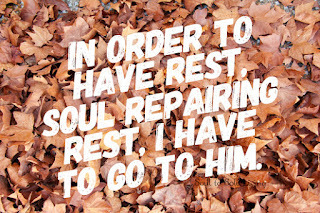 In order to have rest, soul repairing rest, I have to go to Him. I have to hand it all over, and I have to trust that He loves me, even more than I love my littles. And that every decision he makes it in my best interest, just like I do every day for my babies. (They will always be my babies in my heart). He has built the entire universe. He decided that I was needed here. And He has plans so much greater than I can ever imagine. I was stressing about a situation today, because I don't have any control over how it plays out. And my husband looked at me, told me to do my best, and to trust that the end is already written. It doesn't matter if I get it perfect. The plan has been made, and it will unfold in exactly the way it is meant to. I don't know what your questions are today, but I know who has the answers. I know it is so much easier said than done, believe me. But in order to not drive ourselves stark raving mad, we have to start to let go of this make believe "superpower" we hope we have, and realize that the only control we truly have is to trust. Trust in the one who has made us that He knows what is best. Heavenly Father, thank you for always doing what is best for me, even when I get in your way. Help me to trust that you are always working, although I don't always see it. Open my eyes to the opportunities that you put in my path, so that you don't have to work so hard to get through to me. And help me to always come to you, the one who loves me more than I could ever fathom. I pray this in faith. Amen. My husband always laughs at me. Whenever I get a new book, I read the end of it so that I know how it ends. He can't believe that I would want to wreck a new story by finding out how it all turns out. It would drive him nutty to know how it ends before he starts. For me, I feel like I can handle whatever happens at the beginning and middle, as long as I know how it all turns out. I still want all the details. I love to know all of the little steps and decisions that got them to that outcome. I just want the peace of knowing the outcome. My chapters have brought me through many mountains and valleys, and I'd like to think that I have many more to experience. And some days, I really question how I'm going to get through this. I don't know how that last little part of the chapter or story plays out, and it's hard. It's hard to take the next step when you don't trust your feet. I don't know who needs to hear this today, but I know how this ends. I know who wins. 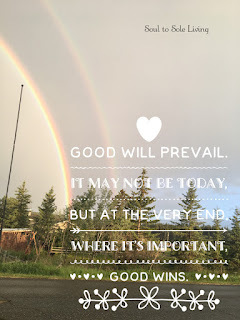 Good will prevail. 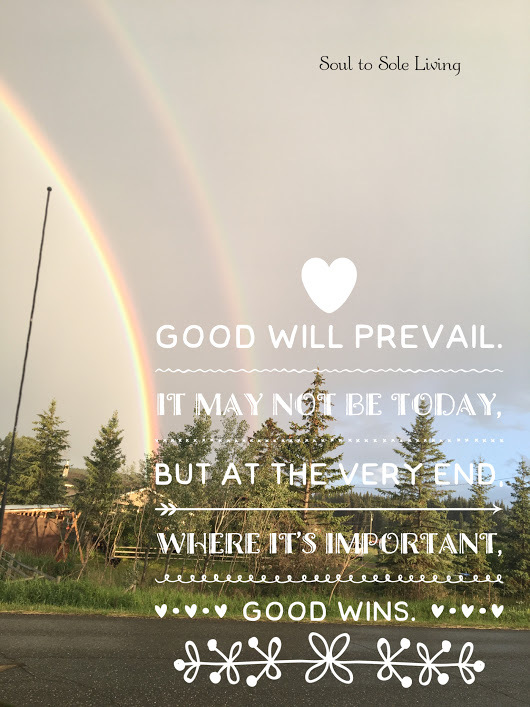 It may not be today, but at the very end, where it's important, good wins. And for those of us who believe in Him, who believe he took our sins, paid the ultimate price and rose again. We know the end. God wins. We know that all of these challenges and triumphs will pale in comparison to the prize we have waiting for us. So friends, as we go about our days, I challenge you to remember that we know the end of the story. We know that love wins. And that is really all that you could ever ask for. I have included affiliate marketing links in some of my posts. Clicking on these links do provide me with a small income, but they are mainly there to cut down your search for that item. You are under no obligation to use these links. If you are not comfortable with that, please feel free to search them on that same website, or do a broader search of your own.